George Bernard Shaw often described composers as either creating a trend, developing it or perfecting it. Haydn and Beethoven were creators, Mozart a perfector, in his thinking. We can in some ways apply this observation to French violin making, its traditions tossed on their ear by Panormo, then developed into something new in the hands of Bassot, Renaudin and Pique. In this scenario, however, we have the anomaly of a maker who both perfected the tradition while simultaneously creating a new one: Nicolas Lupot. Lupot was not the first French maker to copy Stradivari. The Strad model had been brought to Paris by Vincenzo Panormo, while musicians and instrument makers were inspired by the arrival of G.B. Viotti and his exquisite 1708 Stradivari in the early 1780s. 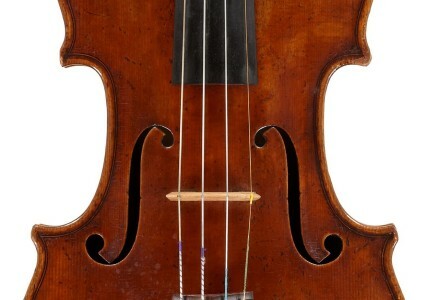 And well before Lupot’s arrival in Paris in 1794, Stradivari models had been made by, among others, François Fent, Joseph Bassot, Leopold Renaudin and François Louis Pique. Indeed, before his arrival in Paris and exposure to Stradivari instruments, Lupot’s work had a far more provincial and naïve character, charming but backward. Nor was he the finest craftsman of his generation – many of those here named were very much his equal in workmanship and technique. What these other makers lacked was Lupot’s keen understanding of the nature of Stradivari’s concept, combined with a strong personal style and character and a breathtakingly beautiful varnish. Far from being slavish copies, mimicking the appearance of authentic Stradivaris, as would become the standard later in the 19th century, Lupot’s instruments are full of the master’s inspiration but also recognizably new and individual. 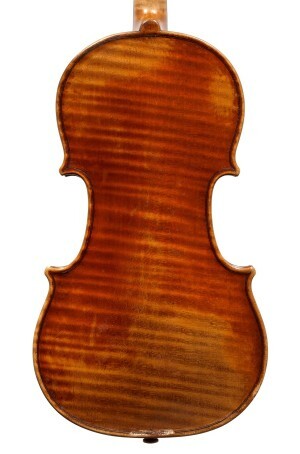 Makers before Lupot rarely copied Stradivari; few after him did not. But no other French maker so successfully achieves such a harmonious balance between these competing impulses, which is why we readily acknowledge Lupot as the supreme exponent of French violin making. This spectacular example from 1799, covered with a rich transparent red-orange varnish that seemingly amplifies in the light, shows why Lupot has gained such an enthusiastic following. A case can easily be made that he was observing fine golden-period Stradivaris arriving from Italy in mostly minimally used condition. His full, broad edging and corners draw strongly from this influence but with his own personal touch, a somewhat overdone ‘bee-sting’. French makers had generally chosen maple for their purfling, but Lupot recognized that this was not what Stradivari used, so he found something to emulate his vibrant whites and intense blacks: slab cut maple for the whites and ebony for the blacks. The arching generally stays true to the original but is, if anything, flatter and less hollowed in the margins. The corner joints, rather than being chamfered, are trimmed and filed to slightly rounded points. The scroll shows yet another moment of self-expression. 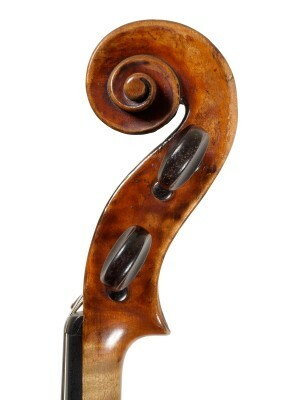 It follows Stradivari, but not too closely: the chamfers are more delicate, the proportions between volutes and peg box are different, the peg box more curved, with a higher belly, the volutes smaller in proportion, and the back fairly narrow and straight, without the gradual taper or compassed tail of Stradivari’s peg boxes. The deep central scribe and compass points along it seem evidence of a desire to at least start with a copy. On the top we find f-holes with a decided vertical stance, more so than on most Strads, and with broader, more horizontally cut wings. This style would be mimicked with increasing crispness by Lupot’s pupil and son-in-law, Charles Francois Gand, as well as by his other important pupil, Auguste Sebastien Philippe Bernardel, and stayed in the family, becoming characteristic of the Gands’ and the Bernardels’ work through both independent practice and merger, and hardly changing at all between this time and Gustave Bernardel’s retirement a century later. Over the years, Lupots have proven a very good substitute for the ever-more costly Stradivaris, and quite a few have inhabited the cases of soloists, chamber musicians and orchestra musicians. The Curtis Institute recognized their potential and acquired at least six of them over the years. This violin was one of them, and it still retains its Curtis stamp on the lower rib. Acquired from England in 1935 by Curtis professor Louis Bailly, it was used by some of the best violin students of that period, including the late Paul Shure. It was sold in 1945, as part of the general sell-off of the Curtis collection.